I really didn't know what to expect from this book and, true to form, it wasn't like anything else I'd ever read. The reader is introduced to five characters and the story is told from each person's perspective. It was a little difficult to get into at first but on reflection it's a very original and well-written novel. If you're looking for something creepy, dark and disparate; this could be for you. My thanks to author Carol James Marshall for providing a copy of this book. The women of the Grey are an alien race of female clones that have come to earth under the orders of their leader Superior Mother. The Women of the Grey are not wicked, or very nice. They live in between the two, not black or white but grey. 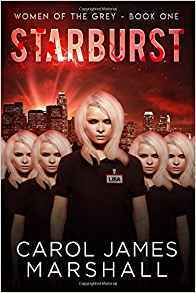 The Women of the Grey live hidden among humans and die by their motto “We are all the same and none different.” In Starburst we meet our anti-hero Lisa. Lisa only wants to follow orders and get back to the Grey, until she is sent on her first mission with human marks. On her first mission Lisa starts to question everything she knows about the grey and everything she doesn’t. In Starburst we also meet the human “marks.” Marks are humans that the Women of the Grey target on their missions. Each Mark is very different from the other. Some Marks live and some well, some might live. The reader will also meet Superior Mother, ruler of the Grey keeper of all their secrets with many secrets of her own. Starburst 1# Women of the Grey is a mysterious and fascinatingly creepy coming-of-age tale for one young woman of The Grey. Starburst will make you question everything—your sanity, the people you interact with (or don’t), why we do the things we do, and the tremendous weight of our emotions. It is intriguing, poetic, and spine-tingling all at once.